When I was in nursing school, I dreamed of being a traveling nurse. I was strategic in my job choices (pediatric cardiac ICU) because I knew those jobs were going to be higher paying and in bigger cities. “I don’t want to end up in some po-dunk little town,” I said. Anyways, life happened and my dreams were put on hold. My chance to be a travel nurse finally happened when I was married, had a two-year- old, and was pregnant with our second. We sold just about everything we owned and moved from Iowa to Nevada. We were debt-free, had five figures in the bank, and were living large. We bought an older RV, but still had to take out a loan on it, which put us into debt. And here’s where it starts to get messy. 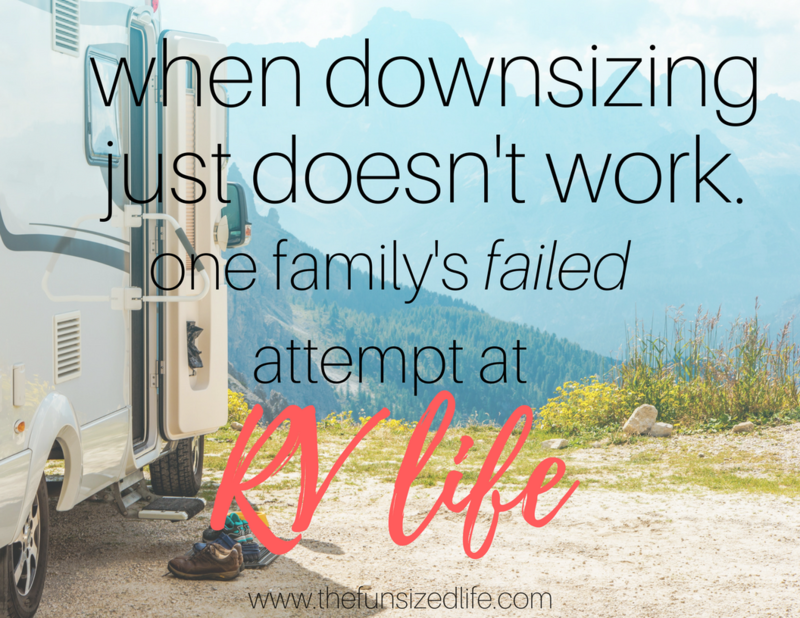 The RV was decently sized, as far as RVs go, and we were able to downsize a significant amount of our personal belongings, which was great for my husband and myself. But how do you store your son’s giant Tonka trucks (you obviously can’t get rid of them)? You shove them in a closet and hope they don’t fall out, that’s how. We couldn’t figure out how to turn the water pump on, so we had to go to Walmart to buy a couple gallons so we could make coffee. When we parked at the RV park that night, they only had a 30amp spot open and our rig was a 50amp. We quickly learned we couldn’t watch tv and run the washing machine without tripping the circuit. The toddler was not happy about the interruptions to Moana. We get to our destination, and I go outside to hook up everything. After I hook up the water hose, I hear my husband start to scream. The toilet was not only clogged, it was backing up – and flooding the bathroom! The only thing I knew to do was to find someone who knew what to do, so I ran around the park and found a wonderful gentleman from Texas who walked us through how to (manually) unclog a toilet (my husband is my hero! ), and he gave us some RV-appropriate treatment fluid. Called the fire department because we smelled gas. Turns out, one of the knobs on the stove was faulty. Had to call a repair man to shut off propane to the stove (our rig was too old for him to have a replacement part on hand, it needed to be ordered). He also helped me learn some basics of electrical wiring and mechanics as we tried to figure out why the hot water heater wasn’t working. During our investigation, we found out that not only were the house batteries bone dry (they each held 3 water-bottles worth of water), but that the heat generated from the dry batteries burned through the metal battery isolator. –Ya’ll, there were literal ashes on this isolator. After a week in St. Louis visiting family, we hitched up and headed to Minnesota. The ride itself wasn’t bad, and fairly uneventful. The problem came when we drove over to the mobile home park where the overseer had said we would have a spot with hookups. First, the directions Google gave me led us straight into the middle of the State Park, and then the service cut out. It was getting dark, and my poor husband had to turn our 40’ rig around on a wet sandbank near some lake. hookups only, the water had already been shut off for the winter and you had to drive to the sewage center to dump. We got out of that town as fast as humanly possible. We drove for an hour and landed in a Walmart parking lot for the night and had a serious talk. My husband was ready to sell the RV and start our life completely over, and I wanted to push through and keep it. We talked for seven hours (for real), and eventually came to the conclusion that trying to find a new assignment while hastily selling the RV and finding another way to haul our belongings was too much to try to fit into a possible few days. We decided to just keep it and work at it. my husband that the best thing to do would be to just cut our losses, sell the RV, and find a permanent nursing position elsewhere. The following week, we sold the RV, found a gorgeous townhouse (we are the first to live in it after the remodel), and I landed a work-from- home job. We paid off all our debt and are back to saving as much as possible. and he had a lot of reservations about the RV life that I ignored rather than respected. As it turns out, all of his reservations ended up being proven accurate. fuse boxes are, because there are multiple, and chances are they are also unmarked. purchasing, so you can find out what you don’t know. It never hurts to ask. whatever room he is currently inhabiting, and the RV just wasn’t big enough for that. In the end, the RV lifestyle works beautifully for some, but definitely not for us. The pursuit of minimalism, while it can be someone stressful, should not induce ongoing stress and anxiety. The real adventure is pursuing dreams created together, where both have a say and are equally committed. Even if that means moving into an 1,100 sq. ft. townhouse. lays out exactly how she and her husband ate a healthy diet for $25 per week! Wow! I didn’t know that! Very cool! Good for you for trying it out and finding what works for you and your family. I can’t even imagine my 2-year old in an RV! The beautiful thing about minimalism is that it looks so different for each person. Your post perfectly shows that. Thanks for sharing your story! Absolutely! It’s much better than wondering what might have been! Brave soul! At least you tried. A work colleague is living in an RV with her husband as they build their new house. Her stories are very similar to yours! Oh no! Hopefully they can get into their house soon! Going Rving can be fun for awhile. I always like to go home. Can be tons of fun. I love that you tried this! I think that is awesome. I am glad you landed such an awesome job afterward! I’m sure there are tons of stories like this. They are just less told! I’m all for minimizing things, but I’m an introvert and need my SPACE from people. I would go crazy cooped up with my family in an RV. Thanks for sharing! Usually the things that go viral are success stories, but it definitely isn’t for everyone. Exactly. It’s nice to hear another point of view and one that I’m sure is common! I have watched the shows about Tiny Houses and I have always said that I couldn’t do it. It’s good to know that I’m not a terrible person for wanting more room to store my kiddos favorite toys, lol. This is a good reminder to do a LOT of research before jumping into a life-change. AB-so-luetely! I love the idea of a tiny house but definitely NOT while I have 3 kiddos under my roof! I think I’d enjoy RV-ing if we wanted to do extensive travelling, but I don’t know that I could ever plan on living in one full time! I so appreciate your honesty here and what excellent tips! I loved reading this story! We are working on downsizing a lot of our things, but definitely plan to stay in our home – just hopefully with less clutter! This is super interesting. My in-laws just purchased an rv since my father in law is retiring this June. That’s something I would LOVE to do when we retire. Not something I want to do with my kiddos just yet though! This was so interesting to read and not what you usually hear! I appreciate the honesty and openness! I really admire you for giving that kind of lifestyle a go, but there’s no way I could have handled it either. The fact that you have a child would have made it so much more difficult as well. Perhaps you could give it another go when any children have moved out, if it’s still something you’d like to pursue. So many great points! I’ve thought of how fun it could be to try RV life but there are plenty of struggles there as well. Where would I put my craft supplies?!? 🙂 Thanks for your real perspective on this. Oh my goodness!! What a crazy story! I can’t even imagine. The RV life doesn’t sound appealing to me at all but boy I was laughing and feeling so sorry for you through the entire post!